Reviewed as streamed from Qobuz. The advertised booklet was not available. 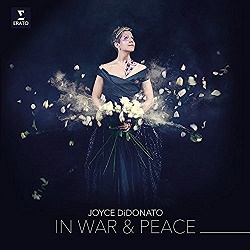 If you thought that Joyce DiDonato had moved on from the baroque, this new Erato album and Bel Air Classique’s release of Handel’s Hercules (BAC513, blu-ray or BAC213 DVD) on which she features with Les Arts Florissants and William Christie should change your mind. Though I ought to have some reservations they were all blown away by the sheer range of music and performance on offer here, with some repertoire from the soprano and some from the alto stable. I imagine that most listeners will be most impressed by the more dramatic moments such as the aria from Leo’s Andromaca (track 2) which also has the virtue of being its first ever recording, one of three such premières in the programme. The highlight of the recital for me is Lascia ch’io pianga from Almirena – available on YouTube. Not since Janet Baker in Orlando at Sadler’s Wells 50 years ago have I heard Handel’s music of lamentation sung with such moving affection. Surprisingly DiDonato omitted Orlando’s Mad Scene from her first recital where it would have been appropriate (Furore, Erato, formerly Virgin, 5190832 – review – review). There are many very fine performances of Lascia ch’io pianga, not least from Magdalena Kožená with the Venice Baroque Orchestra and Andrea Marcon (DG Archiv 4776547: Recording of the Month – review) and Patricia Petitbon with the same orchestra and conductor (DG 4778763: Recording of the Month – review). Those are both first-rate – it was I who made the Petitbon Recording of the Month – but DiDonato gets inside the music more than any other. Similarly, though I greatly admire Sarah Connolly’s Dido (Chandos CHAN0757 – Recording of the Month – or Opus Arte blu-ray OABD7049D/DVD OA1018D – review) DiDonato is at least her equal in Dido’s Lament (track 6). The down side, if such it is, is the tendency occasionally to push the music a little further than it should go. Both my colleagues in reviewing her Handel recording in 2008 noted what Jonathan Woolf called ‘the quivering intensity and occasionally excessive character’ of the singing and the same is true of this new album. The quivering intensity is sometimes accompanied by too wide a vibrato but, like my colleagues in 2008, I cannot wish the fault – if fault it be – undone, the issue being so proper, especially as the softer moments are also noteworthy. In that respect the new recital is more varied than her Drama Queens recording, released in 2012 (Erato 6026542). It almost goes without saying that the accompaniment is first-rate. The recording is very good but I cannot comment on the booklet: the streamed version from Qobuz promises it but trying to access it leads nowhere. The Qobuz and all the CD quality downloads that I checked represented no saving on the CD, currently on sale for around £10. Minor – very minor – reservations apart, I very much enjoyed this stunningly good recording.